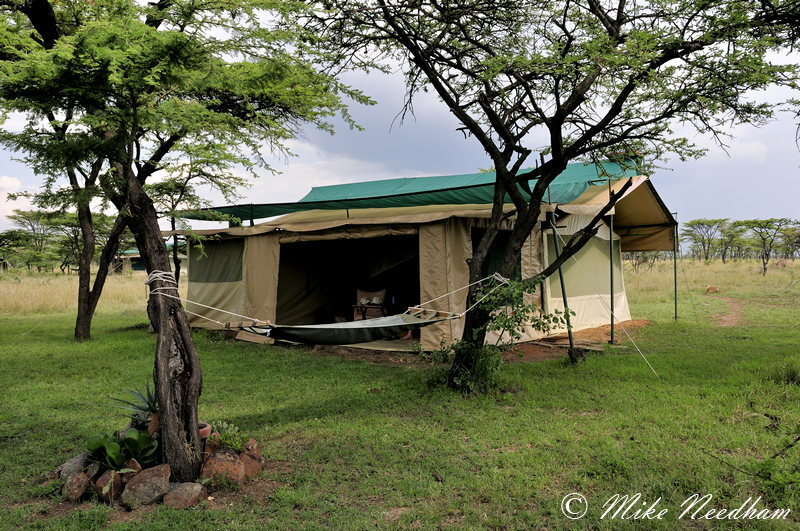 Trip Type: A short safari with my wife and some friends booked through a specialist safari company (Safari Consultants Ltd who were also the organising force behind the 2006 Wild Arena trip). This was not a specific photographic trip. Outline Itinerary: Kicheche Bush Camp, Masai Mara, flying directly from and back to Nairobi International via Wilson Airport. 6 nights. Equipment: Nikon D200/MD-200, D300/MD-10, Nikkors 70-200/2.8, 200-400/4, 18-70/3.5-45, TC-14E, Wimberley WH-200, Gitzo GT3540XLS, SB-800 + laptop, readers, duplicate ext. hard drives, etc. As mentioned above this trip was not meant not be a photographic trip, it was the first time my wife would accompany me on a safari and we were holidaying with friends. That said my friend Liz who organized the trip also likes to do a bit of photography when on Safari and if the photography is not too much of a focus there is no reason why it should impact on other non-photography orientated fellow travelers. So I knew that there would be the opportunity to do some shooting and hence I packed a standard safari outfit. 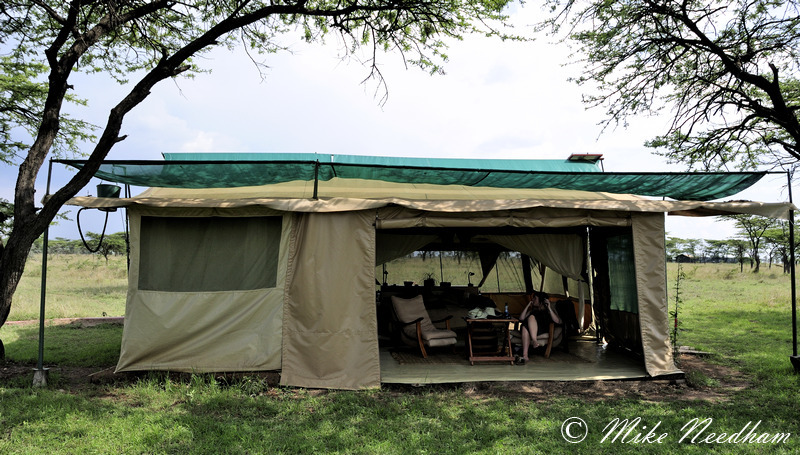 We were only in the Mara for 6 nights but, as we were at a single camp and therefore not having to ‘waste’ time traveling it gave the opportunity for some concentrated wildlife viewing. October however is a little out of the season, especially as it was towards the end of the month. This meant that the migration should be traveling back to the southern plains of the Serengeti and we would need to rely on seeing the local non-migratory game. My expectations for the trip were therefore relatively low and I tried in advance to manage my wife’s expectations accordingly, but we were there with friends for a holiday and it would all be new to my wife. Also any opportunity for photography would be a bonus (I had already had excellent trips to Finland and South Africa – what a year!). 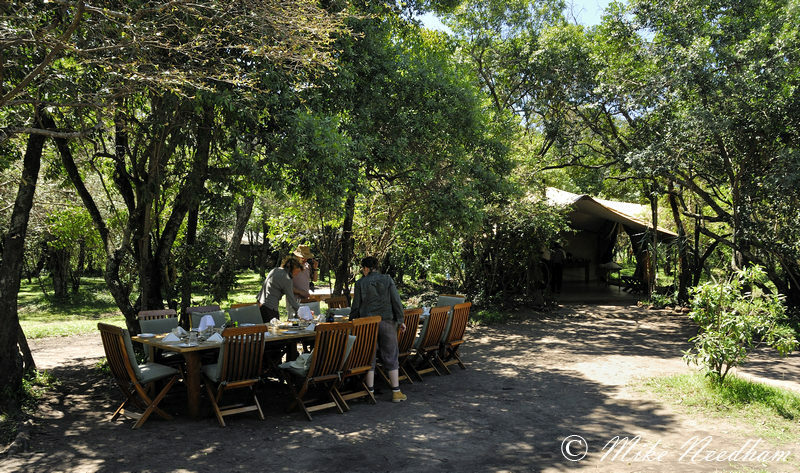 Lunch at Kicheche - this is actually "Main Camp"
My low expectations were totally unfounded and the trip reiterated the views of many that despite the cyclic nature of the migration there is actually no true “low season” in the Mara. We had the most amazing week of game viewing and every single day was amazing, to the point that on any other trip I had been on each day of this trip would have been the highlight. 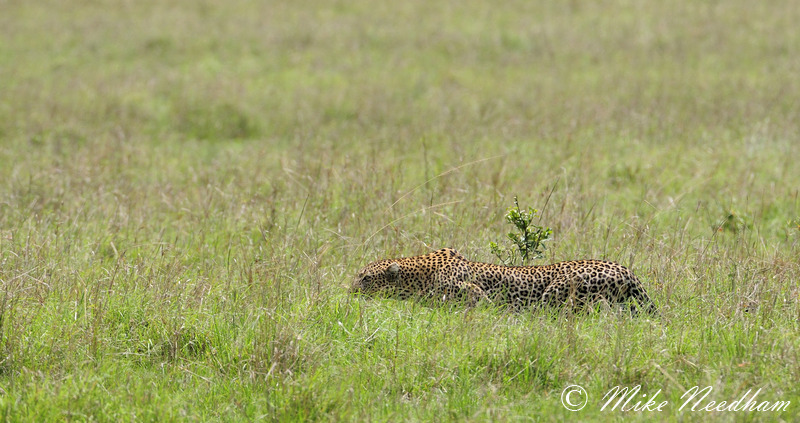 As an example, on one particular day we saw 9 (yes nine) different leopards. Yes some of these were cubs but hey, I was not complaining. One of these was an adult stalking a male impala. We watch for a little while as the cat slowly edged closer and closer to the antelope but, still too far away for a successful strike she was spotted and the impala snorted and ran off through some thick bush. The leopard halfheartedly bounded after it, clearly not putting anything like full effort into a serious attempt to make a kill. 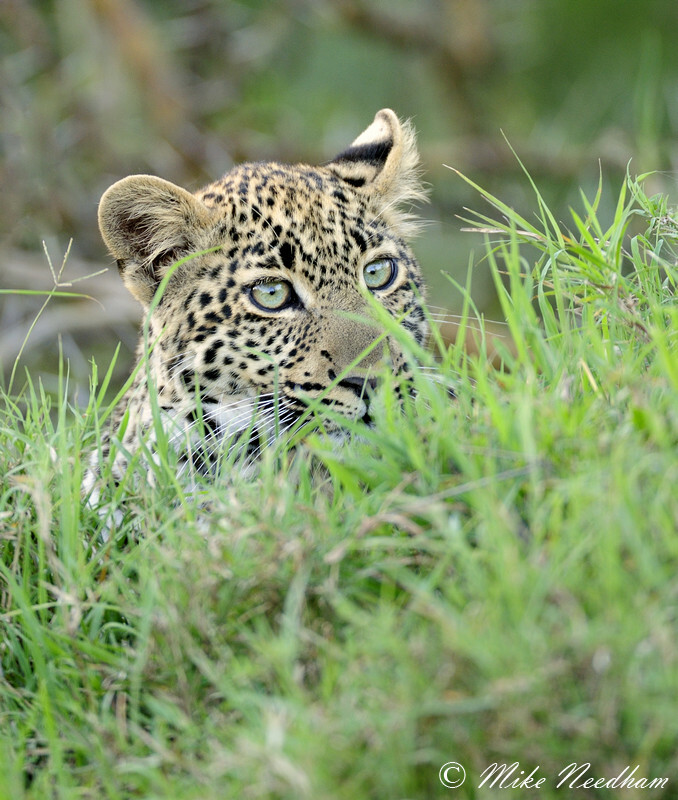 The guide started the engine and we quickly drove around the far side of this area of undergrowth to see if we could see the leopard coming out of the other side. We were quickly on the scene and just in time to see a leopard dart out of the bushes as expected, but something didn’t look right. This was actually a different leopard which had presumably been spooked by the hunter and was making off to somewhere a little more peaceful. In addition we saw two different females, each with two cubs, several miles apart. These, plus another lone adult in yet another area, gave us the amazing score of nine leopard sightings in one day. The two families were quality sightings that were very productive. A couple of days in we saw a cheetah with cubs looking like she was about to hunt. We were not particularly close to her but after a couple of minutes our guide started the engine, turned the vehicle around and started to drive away from her. I have to confess to being a little perplexed at this but thought that he must have heard of something even better over the radio. 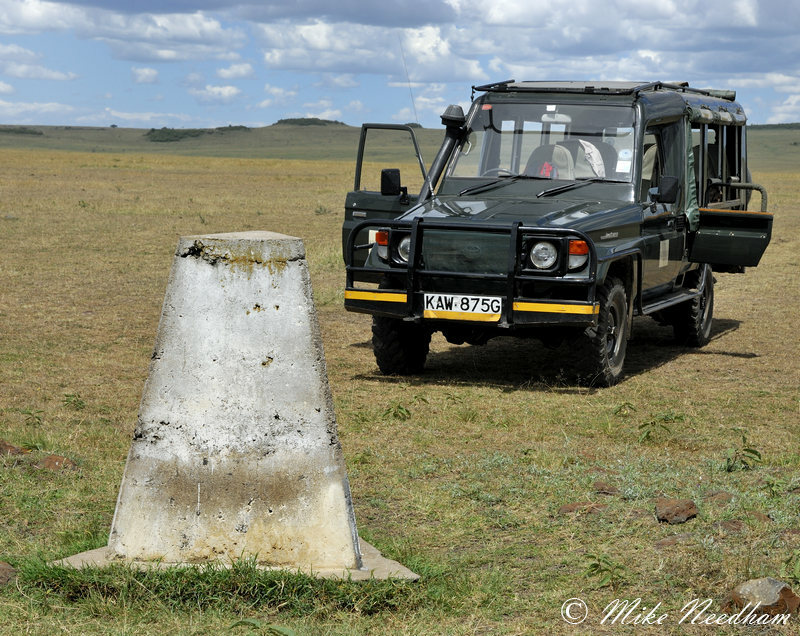 My confusion built however when he parked up at the top of the hill several hundreds of metres from the cheetah. I obviously understand the need to give the animals space and not influence their daily life, especially when hunting, but this seemed a little overkill especially as another vehicle (with a less switched on guide?) was still at the bottom of the hill. We had been parked for about 10 minutes when someone noticed a young Thomson’s gazelle (Thomi) lying still in the grass between our two vehicles (which were about 20-30m apart). The cheetah was not showing any increased interest in hunting at this point. Another 5 to 10 minutes had passed when the mother cheetah started to purposely walk towards the herd of adult Thomi who were clearly aware of her and scattered. The cheetah started to jog but I was sure the ‘hunt’ was over. I was wrong, the young Thomi near to us was clearly unsettled by the distant commotion and started to run towards its mum. The cheetah’s hunting strategy (and our guide’s thinking) was becoming clear, she was trying to flush out one of the young Thomi hiding in the grass and the one near us had panicked. 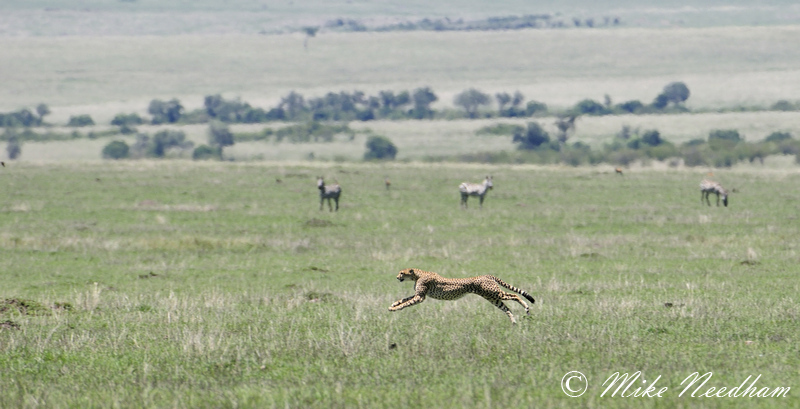 The cheetah moved effortless up several gears and despite the Thomi running for its life, she closed the huge gap at an amazing rate, tripped and grabbed it. 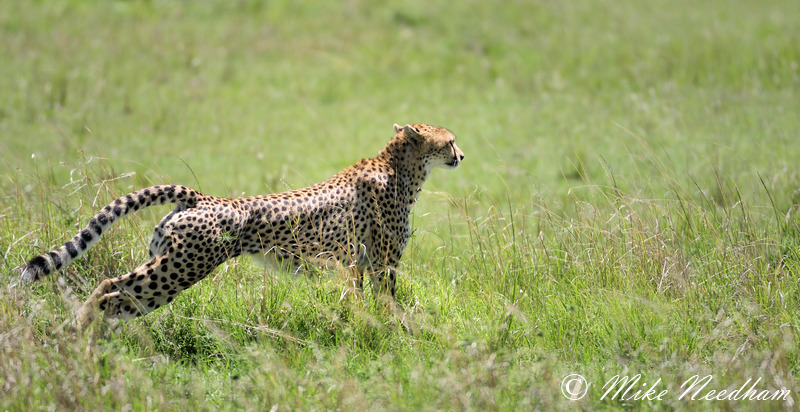 If I hadn’t have seen it I would never have believed that the cheetah could have closed such a long gap on such a fast animal. Sadly this was all too distant for any good shots but was an amazing sight and we had the perfect viewpoint from which to take it all in. My picture sequence went from a cute little Thomi in lying in the grass to the next one being of the same youngster lying limply in the cheetah’s jaws. 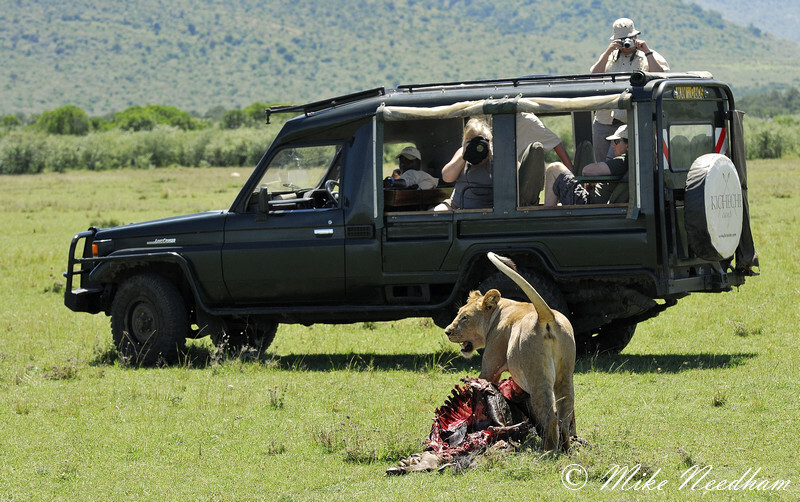 This was my first big cat kill, I had seen the immediate aftermath several times, but never the actual kill (other than a leopard in 2006 which had a hare virtually run into its mouth as it rested in long grass, but I don’t really count that). A couple of days later we were lucky enough to see a second cheetah kill, but again it was a little too distant for quality photographs. 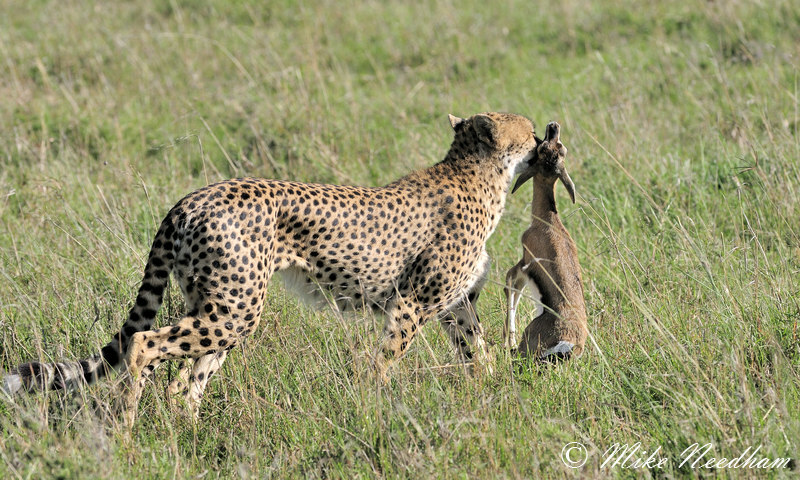 Cheetahs were not the only hunters looking for a meal on this trip. One afternoon we were barely out of camp when we heard a commotion. The birds in a small area of bush were clearly distressed with several intense alarm calls breaking the peace of the afternoon. 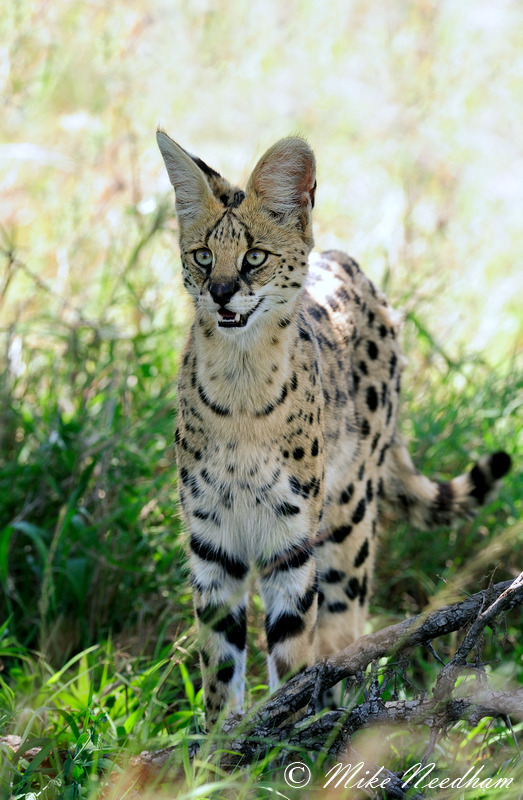 I assumed (and hoped) that it was a small cat, either a serval or caracal. I asked the guide and he confirmed that it was either a cat, or maybe even a snake! We headed toward the noise where we found a green mamba about 6 ft off the ground in a small acacia bush just backing itself out of a starling nest with a chick in its mouth. It descended and disappeared into the long grass to eat its meal. I my experience it is rare to even glimpse a snake whilst on safari, so to see one ‘hunt’ was a real bonus. 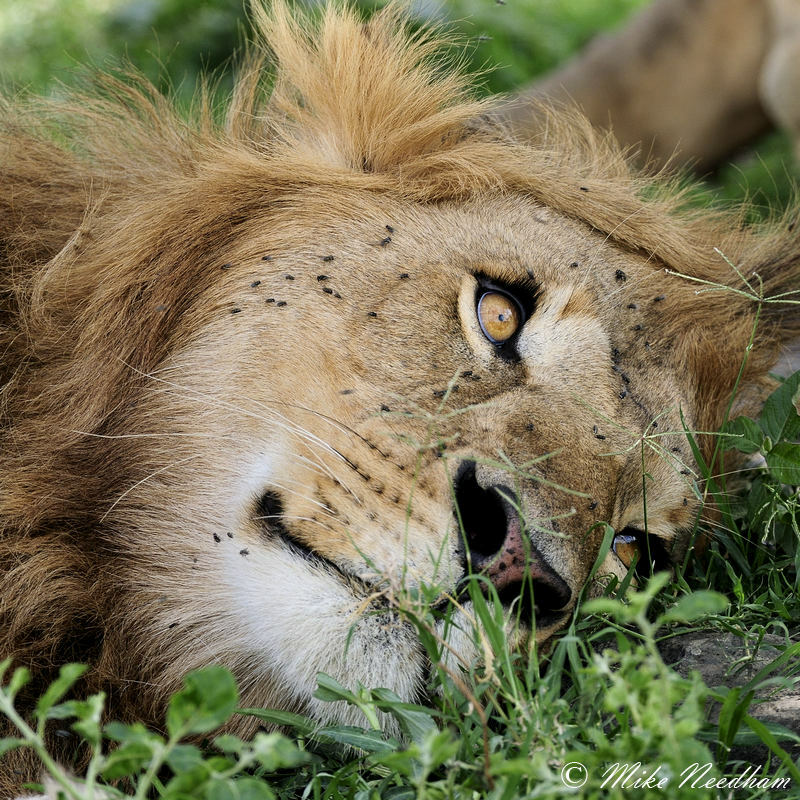 One hot afternoon we came across a kill hidden in the bushes, then 20-30m away two male lions, one clearly much younger than the other, lying quietly in the shade. We watched them for a few minutes until a lioness approached. With no warning the older male turned ferociously on his younger companion (himself a large imposing creature). The ensuing fight was intense and swift and left the younger animal limping and retreating away from the shade. I had been taking some head shots with a long lens when it kicked off, in the time it took to drop this on the seat and pick up my second camera, with a shorter lens already installed, it was all over. 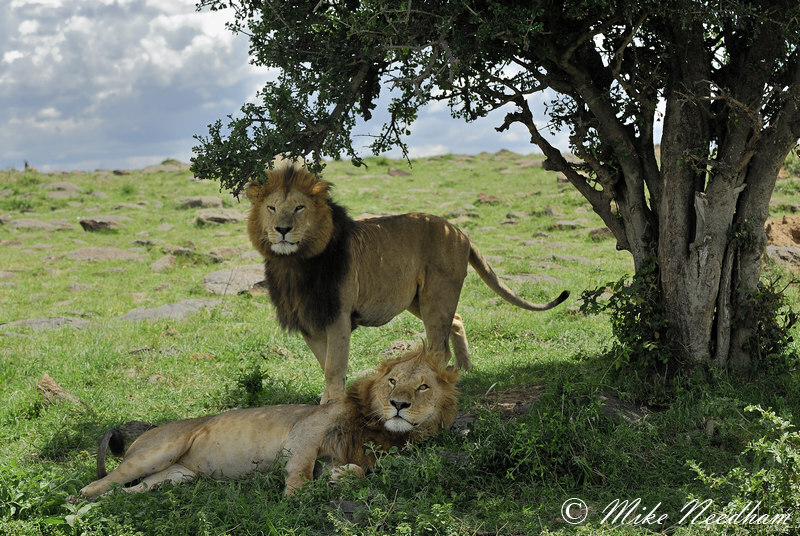 The female drifted off and eventually the young male cautiously returned to the shade by his older adversary. The female then returned and the older male again, but this time less violently, so off his potential rival. Clearly the female must have been in breeding condition and the older male was not prepared to tolerate any potential rival being around her. 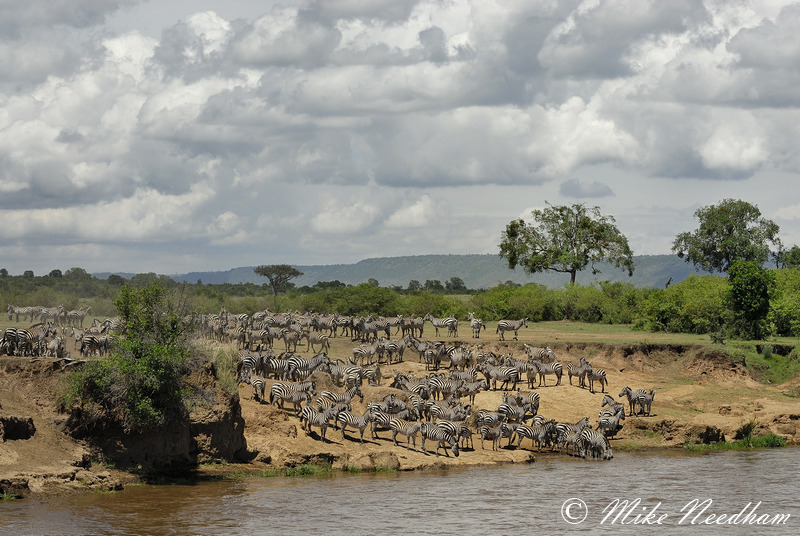 We were also fortunate to witness the tail end of the migration backed up at the Mara River and attempt a crossing. There were very few wildebeest who had presumably long since already crossed, but there were large numbers of zebra. I had certainly never seen such numbers of zebra before. This was a real bonus and totally unexpected at this time of year, giving my wife a glimpse of a Mara River crossing. And so the week went on, every morning and every afternoon there was something amazing to see, certainly many more things than I have time to recount here. But eventually it was the final morning drive before catching the plane back to Nairobi. It was relatively uneventful and so we started to head back to camp for the final time. 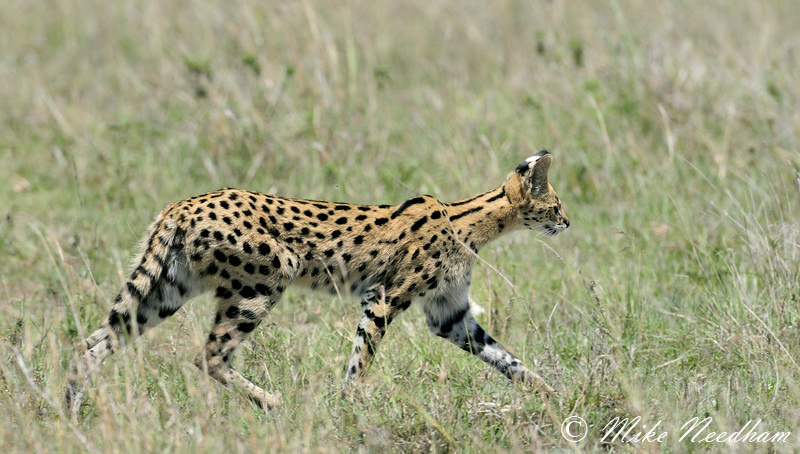 On a couple of evenings we had glimpses of a serval so the guide headed back via the area it had been seen and, sure enough, it put in an appearance for about 20-30 minutes which we ended our trip with and started the journey home. It had been a most amazing week of sightings (and photography). Going on a trip specifically orientated towards photography cannot guarantee success, and as this trip proved, going on a general trip should not rule out good photography. This is especially true in East & Southern Africa. 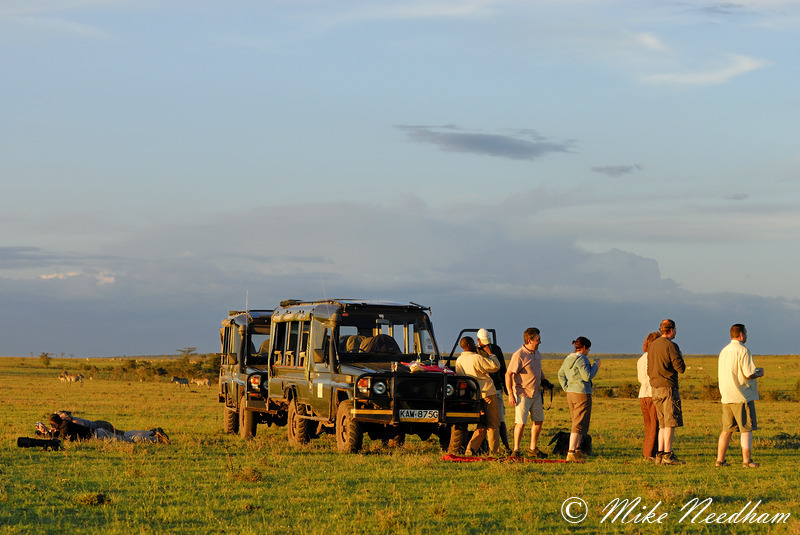 The key to success is to spend as much time as possible on game drives at the extremes of the day, go to a region with good game density, don’t have too many people in your vehicle, having a good guide, and finally a little good fortune. Ultimately any type of trip is better than nothing, if you stay at home constantly waiting for the perfect trip you will never see or photograph anything!